Unicover Truck Caps makes rugged, heavy duty commercial aluminum truck caps. Unicover Truck Caps has been making best in quality, best in value and best in good looks aluminum truck caps for over 30 years. 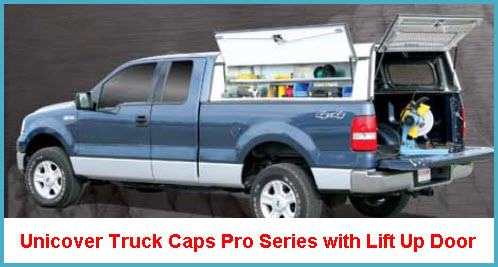 So if you have need of a heavy duty commercial work cap or a seriously rugged topper for recreational purposes, Unicover has the truck cap for you. Unicover also carries a very nice line of fiberglass truck caps from Jason Truck Caps . Unicover Truck Caps manufactures two primary product lines of aluminum truck caps. The first line is the Standard Aluminum Cap Line. 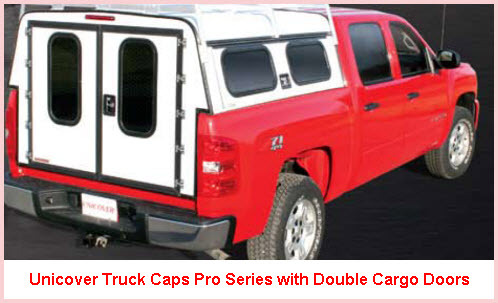 Designed for a hard day at work or serious play the 8 aluminum truck cap models in the Unicover Truck Caps Standard Line differ basically in their side and rear door configurations. The second product line is the Pro Series Caps which consists basically of 4 different models differing in the rear door configuration. In either case you may find that universal absorbent floor mat protectors help you reduce the cleanup associated with liquid spills, mud and gunk attack, mold smells and mildew growth. So lets cut to the chase and get into some detail on all the models. Cab High model with lift up door that secures the rear tailgate. An inner plastic liner protects the side doors. The Hatch Back door model is popular with the optional bi-level roof that offers improved aerodynamics, greater storage and easier access. Double cargo doors for easy access makes this model a great choice. With an optional increase in the height of the cap this model lets you load and unload significantly larger items. The walk-in door model is like the double cargo door model but with just one big rear door. The optional 30" high cab provides additional work and cargo area and … you only gotta open 1 door!! !